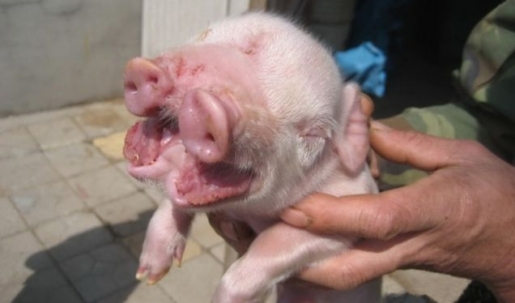 A very unhappy two-snouted piglet. Meet Little Piggy Two-Nose. That’s not the pig’s name, but what else would you call a pig who was born with a very unique double-sided face? That’s right, a pig with two functioning snouts was born on a Chinese farm, and now the farmer who helped raise the little porker is hoping that she will become a tourist attraction. While she’s not as adorable as the four-eared cat, she’d make a perfect pet for the baby with two faces. That said, don’t worry about the fat little piglet’s future. No matter how much food she eats with her two mouths, she won’t become dinner. Said Bai of his prized piglet, “She is too special to end up on a plate.” Bai and his family actually hand-fed and hand-raised the piglet, who due to her condition could not suckle normally, until she could eat solid foods on her own.